Association studies are of great interest to identify genes explaining trait variation since they deal with more than just a few alleles like classical QTL analyses. They are usually performed using collections representing a wide range of variability but which could present a genetic substructure. The aim of this paper is to demonstrate that association studies can be performed using synthetic varieties obtained after several panmictic generations. This demonstration is based on an example of association between the gibberellic acid insensitive gene (GAI) polymorphism and leaf length polymorphism in 'Herbie', a synthetic variety of perennial ryegrass. Leaf growth parameters, consisted of leaf length, maximum leaf elongation rate (LERmax) and leaf elongation duration (LED), were evaluated in spring and autumn on 216 plants of Herbie with three replicates. For each plant, a sequence of 370 bp in GAI was analysed for polymorphism. Genetic effect was highly significant for all traits. Broad sense heritabilities were higher for leaf length and LERmax with about 0.7 in each period and 0.5 considering both periods than for LED with about 0.4 in each period and 0.3 considering both periods. GAI was highly polymorphic with an average of 12 bp between two consecutive SNPs and 39 haplotypes in which 9 were more frequent. Linkage disequilibrium declined rapidly with distance with r 2 values lower than 0.2 beyond 150 bp. Sequence polymorphism of GAI explained 8-14% of leaf growth parameter variation. A single SNP explained 4% of the phenotypic variance of leaf length in both periods which represents a difference of 33 mm on an average of 300 mm. 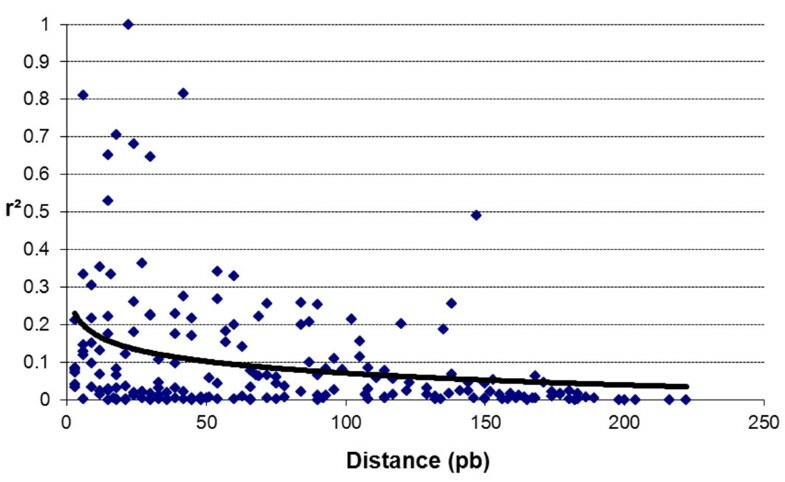 Synthetic varieties in which linkage disequilibrium declines rapidly with distance are suitable for association studies using the "candidate gene" approach. GAI polymorphism was found to be associated with leaf length polymorphism which was more correlated to LERmax than to LED in Herbie. It is a good candidate to explain leaf length variation in other plant material. Genetic association studies using accessions of unknown pedigree are increasingly used in plant biology to identify genes explaining variation of traits. Indeed, when compared to quantitative trait loci (QTL) analyses, these studies present the advantage of i) comparing concomitantly several alleles, ii) avoiding laborious population constructions and iii) exploiting the recombination events that have occurred over several generations [1–3]. For association studies, two approaches are possible base on the pattern of linkage disequilibrium (LD) decline . The first one is the candidate gene approach used for populations showing a rapid LD decline. The second one is the whole genome scan approach used for populations showing a slow LD decline . These two approaches have been mainly used for analysing the genetic variability of a species through core collections. However, core collections are often genetically structured, thus leading to the detection of spurious associations between the polymorphism of markers and traits [5–7]. In order to circumvent the detection of spurious associations, different methods of data analysis have been developed that take into account the core collection's substructure . Nevertheless, the use of these methods allows only to study the intra-group variability while leaving the inter-group variability unexploited. Ideally, the best plant material for association studies should be multi-allelic and without any substructure. This is the case in synthetic varieties, obtained after several panmictic multiplication generations, as shown by Auzanneau . However, to our knowledge, there are no previous reports concerning association studies on synthetic plant varieties. Perennial ryegrass is the most sown forage and turf grass species in temperate climate and it is considered as a model for genomics in forage grasses . In this species, like in all forage grasses, leaf length is an important trait affecting: i) vegetative yield [10–12], ii) intake rate by dairy cows , iii) plant survival under light competition conditions . Furthermore, it is a quantitative trait presenting a large variability and a high heritability [15–17]. GAI plays an important role in plant growth in several species by acting on the gibberellin signal . Mutants of this gene exist in various species, with dwarf or giant phenotypes. Some dwarf mutants are OsGAI in rice , Rht-D1 in wheat  and gai in Arabidopsis [20, 21] and some giant mutants are SLR1 in rice , sln in barley [23, 24], and spy in Arabidopsis . Moreover, GAI is mapped on linkage group 3 in rice http://www.ncbi.nlm.nih.gov/entrez/viewer.fcgi?val=13699786&itemID=65&view=gbwithparts and on linkage group 4 in perennial ryegrass . In addition, a QTL of leaf length was found on linkage group 4 in the region of GAI . The aim of this paper is to demonstrate that an association study following the candidate gene approach is possible in synthetic varieties. This demonstration is based on an example of association between the gibberellic acid insensitive gene (GAI) polymorphism and leaf length polymorphism in 'Herbie', a synthetic variety of perennial ryegrass (Lolium perenne L.) which presents no substructure and a short LD decline . 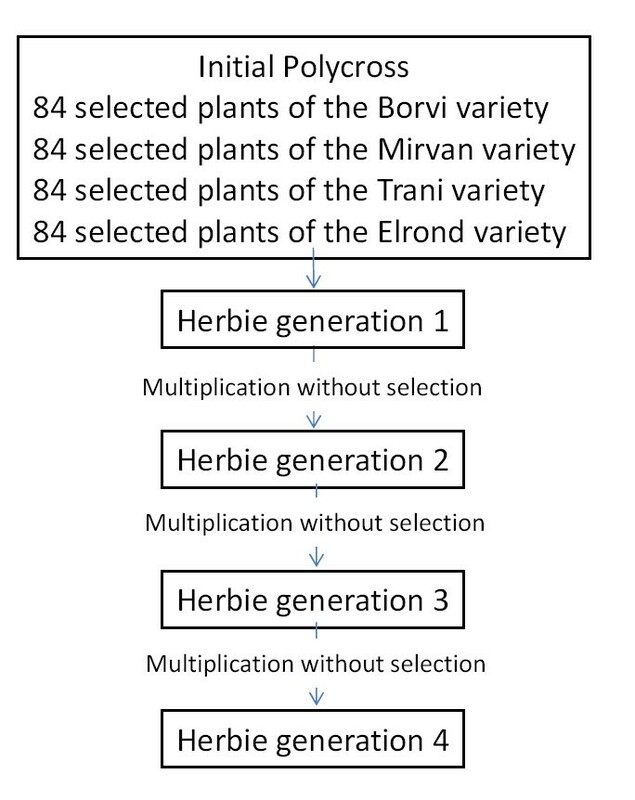 Moreover, a core collection of perennial ryegrass was used in order to compare the phenotypic variability observed in 'Herbie' against the variability present within the species. We studied 216 plants of the 'Herbie', a synthetic variety chosen because of its large variability and because LD decreases rapidly . It was registered for the first time in 2000 in France. We used the fourth generation of multiplication after the initial polycross in which 336 parents with 4 different origins were involved (Figure 1; Thieu Pustjens pers. com.). Seeds were sown in summer 2003 in individual pots and stored above 10°C with at least 14 hours of light per day in a greenhouse in order to avoid vernalization until the 24th of February 2004. At this date, three clones per plant of one main tiller were produced for phenotyping in spring and one clone was produced for conservation. This last clone was used to produce three new clones in autumn. We used 100 ecotypes (one plant per population) chosen in an Eurasian core collection in order to maximise the number of geographical origins (François Balfourier, pers. com., Supplementary data). For convenience, we named these 100 ecotypes: core collection (Cc). Seeds of this collection were sown in February 2004 in individual pots and stored above 10°C with at least 14 hours of light per day in a greenhouse until the 30th of September 2004. At this date, three clones per plant of one main tiller were produced. Description of the creation of the variety 'Herbie'. Two experiments with three replicates each were conducted in a greenhouse: the first in spring 2004 with Herbie genotypes and the second in autumn 2004 with Herbie and Cc genotypes. For each plant, one main tiller with its daughter tillers was planted at both periods. Plants were watered and nitrogen supplied in order to avoid any stress. After a growth period of three weeks, plants were cut back. The third and fourth uncut leaves that appeared after this defoliation were measured on one tiller per plant, three times a week from the time of their emergence until they reached maturity. Thermal time was calculated in growing degree days (°Cd) using a simple sum of mean daily air temperature above 0°C taking the day of cutting as a starting point. The spring experiment began on March 17, 2004 and finished on May 12. However, the plants were followed until the end of July in order to confirm their vegetative state by the absence of floral stem. The autumn experiment began on October 21, 2004 and finished on January 12, 2005. During the autumn experiment, the greenhouse was heated to maintain a temperature higher than 10°C. for tc ≤ t ≤ te and tc ≤ tm < te. For t > te, Eq. 1 is reduced to Y = Ym. Y (mm) is the leaf length at any time, Ym (mm) is the final leaf length, tc the time when leaf growth starts (°Cd), tm is the time at which the maximum leaf elongation rate is reached (°Cd) and te is the time when leaf growth ends (°Cd). Model fitting was performed by using the NLIN procedure of SAS . Parameters were optimised using the Levenberg-Marquardt iterative method with automatic computation of the analytical partial derivatives [32, 33]. Seed values were as followed: tc ranged from 0 to 10 increasing by 1; tm ranged from 10.001 to 1,000 increasing by 10 and te ranged from 150 to 1,200 increasing by 10. For each leaf, Ym value was given by its maximum measured length. Only plants with data on both the third and fourth leaves were analysed. An example of the Eq. 1 fitted to data is given in Figure 2. Example of the Eq.1 function fitted between leaf length and thermal time. Leaf elongation rate obtained by derivation of the function is shown. Are indicated: the maximum leaf length (Ym), the starting time of elongation with a leaf length of 5 mm (tc), the time when the speed elongation is maximal (tm), the time when the leaf finishes growing (te) and the leaf elongation duration (LED). The maximum leaf elongation rate, LERmax, for each leaf was numerically obtained from Eq. 3. Summarising, three variables were studied at two growing periods, spring and autumn: final leaf length (Llength), leaf elongation duration (LED) and maximal leaf elongation rate (LERmax). For each Herbie genotype, DNA was extracted from 1 g of young leaf using a cetyltrimethyl ammonium bromide (CTAB) protocol [34, 35]. DNA quantity and quality of each sample were assessed on agarose gel. Herbie plants were genotyped using one SSR marker per linkage group (LG): B4D7 on LG1, G02-049 on LG2, G07-058 on LG3, G03-10 on LG4, pps397 on LG5, G04-56 on LG6 and G02-004 on LG7 [36, 37]. PCR reactions and separation of amplified products were performed as described for SSRs in Barre . In order to amplify a fragment of the GAI gene in Lolim perenne L., degenerated primers were designed on an alignment between OsGAI http://www.ncbi.nlm.nih.gov/entrez/viewer.fcgi?val=13699786&itemID=65&view=gbwithparts, Rht-D1a (AJ2425311), SLN-1 (AF460219) and DWARF8 (AJ242530) homologous GAI gene in rice, wheat, barley and maize, respectively. A sequence of 370 bp in GAI was amplified in the coding region (Figure 3). PCR reactions were set up in 50 μL volumes in 96-well PCR plates. Each PCR reaction was performed with 40 ng of template DNA, 0.4 μM of each primer (5'-GACYTGGAGCCSTTCATGCT-3'; 5'-GTACACCTCSGACATGACCT-3'), 2 mM MgSO4, 0.2 mM dNTP, 1 U Platinium Taq DNA polymerase High Fidelity (Invitrogen) and 1X PCR buffer (Invitrogen). The amplifications were performed using a PTC100 thermal cycler with the following program: 10 min at 94°C, followed by 35 cycles of 94°C for 1 min, 58.7°C for 1 min and 68°C for 2 min, a final extension of 10 min at 68°C. PCR product of each sample was purified using QIAquick Multiwell PCR Purification Kit (QIAGEN) and sent to Millegen, Toulouse, France for direct sequencing of PCR products with the forward primer. The direct sequencing of the PCR products allowed to obtain the genotype of each SNP but not the phase between SNPs. Sequences of GAI were obtained for 190 'Herbie' genotypes. Representation of GRAS protein structure from Bolle . DELLA and VHIID protein domains and leucine (Leu) rich regions are indicated. The arrows show the amplified part of GAI studied. Genotypic variance ( σ G E 2 ) and residual variance ( σ E 2 ) were estimated using the VARCOMP procedure of SAS with the method residual maximum likelihood algorithm REML . with Y ijk the value of genotype i taken in the block j for the period k, μ the average of the population, G i the effect of genotype i (random effect), Periodk the effect of period k (fixed effect), (G × P)ik the effect of the interaction Genotype × Period (random effect), B j (P k ) the effect of block j nested in period k (fixed effect) and eijk the residual (random effect). G and P effects were tested using G × P interaction as residual and G × P interaction was tested using the model residuals. Genotypic variance ( σ G E 2 ), genotype × period interaction variance ( σ G E x P e r i o d 2 ) and residual variance ( σ E 2 ) were estimated using the VARCOMP procedure of SAS with the method REML . Pearson's correlations between traits were calculated on the adjusted means by genotype (option LSMEANS of GLM procedure) using the CORR procedure of SAS . STRUCTURE software version 2.3  was used to estimate the substructure of 'Herbie'. The length of the burn-in period was 50,000 and the number of MCMC replications after the burn-in was 100,000 for each. The given number of populations (K) was varied between 1 and 10. Computing was performed 50 times for each K value. The identity of amplified sequences was checked using a BLASTN on NCBI http://www.ncbi.nlm.nih.gov/BLAST/. The sequences were aligned and manually checked using STADEN package 1.6.0 http://staden.sourceforge.net/. Data were formatted using TRITIPOL http://bioweb.ensam.inra.fr/tritipol/ and REFSEQV5 (pers. com. Fabienne Granier, INRA, Versailles, France). Haplotype phase between SNPs was estimated using PHASE 2.1 software [39, 40]. Haplotype number and haplotypic genotype for each individual were inferred. The r2 values of gametic LD between SNPs were determined according to Hill and Robertson  on the haplotypes inferred by PHASE using DNAsp software . Genotypic LD between each pair of SNPs or SSRs was calculated using GENEPOP software . where Yi is any dependent variable (in our case: Llength, LERmax or LED);X1, X2,..., Xn are the independent variables (in our case: 20 SNPs), β0, β1, β2,..., βn, the regression coefficients and εi the error term. It was computed with the STEPWISE option of REG procedure in SAS . 2) a Scheffe's multiple comparison analysis for orthogonal linear contrasts  in order to test the effect of presence versus absence of each not rare haplotype (i.e. more than 10 plants holding the haplotype). It was computed with the GLM procedure in SAS  following the model given by Eq. 4. 3) a tree-scanning analysis of the phenotypic data against the haplotype tree. It was performed with TREESCAN 1.0 http://darwin.uvigo.es/software/treescan.html [45, 46]. This method allows testing the mean difference of a trait between two groups obtained for each branch of a phylogenetic tree. 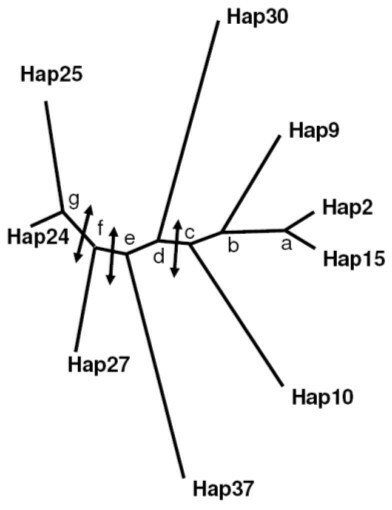 Haplotypes present more than 10 times in the population were used to construct a phylogenetic tree with PHYLIP 3.67 http://evolution.genetics.washington.edu/phylip.html using maximum parsimony. In the execution of the TREESCAN program the number of permutations was 5 000, and the minimum class size was set to five. Llength, LERmax and LED were determined for 216 plants of 'Herbie' in spring and autumn and on 100 plants of a perennial ryegrass core-collection (Cc) in autumn. Three replicates were used. Genetic effect was highly significant for all traits for both Herbie and the Cc and for both growing periods. Heritability was high for Llength and LERmax and medium for LED (Table 1). For all traits, a significant Genotype × Period interaction was detected in 'Herbie' and moderate heritabilities were found for both periods (Table 2). The variability of 'Herbie' was as high as the variability of the 'Cc' (Table 3). Correlation values between variables are presented in Table 4 for 'Herbie' including both spring and autumn measurements. For the 'Cc', correlations between variables during autumn were highly significant (P value < 0.001) between Llength and both LERmax (0.87) and LED (0.46), but not significant (P value > 0.05) between LERmax and LED. In both 'Herbie' and the 'Cc', leaf length was significantly correlated to both LERmax and LED with higher values for LERmax. On the other hand, LERmax and LED were not or were weakly correlated. Leaf parameters measured in spring were correlated to those measured in autumn with a stronger correlation for Llength and LERmax than for LED. Results from the analysis with STRUCTURE software, using one single sequence repeat (SSR) marker per linkage group, showed no evidence of substructure in 'Herbie' (Table 5). Furthermore, as expected between unlinked markers in a population presenting no substructure, no significant genotypic LD was detected between pairs of SSRs. Twenty SNPs were detected in the 370 bp GAI sequence of 'Herbie' (Table 6). This corresponds to an average of 12 bp between two consecutive SNPs. Among these SNPs, six presented rare alleles with frequencies lower than 10% and one (GAI206) was not synonymous. PHASE software revealed the existence of 39 haplotypes (Table 7). Nine of them were present in more than 10 genotypes. Gametic LD decreased rapidly with the distance (Figure 4). Indeed, r2 values became lower than 0.1 beyond 150 bp. Genotypic LD results were in agreement with Gametic LD results (data not shown). For distances lower than 150 bp, more than 35% of SNP pairs presented a significant LD (threshold at 0.01 after a Bonferroni correction). Nonetheless, beyond 150 bp, SNP pairs did not present any significant deviation from linkage equilibrium. Pattern of gametic linkage disequilibrium (LD) decays. LD was measured between SNPs pairs, with r2, from haplotypic data of GAI gene inferred by PHASE software. A logarithm fitting-curve is presented in black (R2 = 0.09). Three statistical methods were used to detect the association between the phenotypic polymorphism and GAI polymorphism. The first method was a stepwise regression between leaf parameters and the 20 SNPs of GAI found in 'Herbie' (Eq. 8). The results are summarized in Table 8. It showed that, depending on the leaf parameter, three to six SNPs explained 8-14% of the phenotypic variance (R2). One SNP, named SNP069, appeared to be particularly interesting since it explained 2-5% of each parameter variance in both spring and autumn. It explained a difference of leaf length equal to 42 mm, for average leaf length of 312 mm, in spring and a difference equal to 30 mm, for an average of 303 mm, in autumn. It is noteworthy that the highest values of leaf growth parameters were obtained for heterozygous individuals showing a superdominance effect at SNP069. The second method consisted of a Scheffé analyses in order to test the effect of presence versus absence of the different haplotypes on each trait (Table 9). The comparisons of means for the significant contrasts are presented in Table 10. The third method was a tree-scanning analysis of associations between haplotypes and leaf parameters. The haplotype tree is presented in Figure 5 and the results of the TREESCAN analysis is presented in Table 11. The strongest effect of phylogenetic groups on all traits was on LERmax in spring between the group of haplotypes: 2, 9, 10 and 15, and the group of haplotypes: 24, 25, 27, 30, 37. These two groups can be separated by polymorphism at SNP069 (Table 7). This separation had also an effect on Llength in spring. An effect was found on LERmax in spring and in autumn between the group of haplotypes 24 and 25, and the group including all the other haplotypes. These two groups can be separated by SNP114 and SNP138 which were in complete linkage disequilibrium when considering the nine most abundant haplotypes (Table 7). For all tests, the corrected permutational P-values after monotonicity were higher than 0.05. Haplotype tree of the SNP polymorphism from the GAI gene. The haplotypes are shown in Table 6. Only haplotypes present more than 10 times were taken into account. The arrows indicate the transitions with a Psim higher than 0.05 in the tree-scanning analysis. The tree was obtained from the program PhyloDraw (contact: jhchoi@pearl.cs.pusan.ac.kr) on the basis of the treefile output from PHYLIP. The phenotypic variability of 'Herbie' was very high and similar to the one observed in a core collection (Cc). This high variability of 'Herbie' was also observed on molecular data . Such variability can be explained by the high number of parents (336) in the initial polycross. This diversity shows that selection should be efficient even within a variety. High heritability values were observed for leaf length and maximum leaf elongation rate (LERmax) within each period of measurements. Lower heritabilities were observed when taking into account both spring and autumn periods. These results are in accordance with values from different studies in forage grasses [16, 17, 47–49]. The significant Genotype × Period interaction indicates that the response of genotypes to environmental conditions did not follow the same trajectories. This is reflected by the correlation values between spring and autumn leaf length or LERmax which were only moderately high (Table 4). As previously observed by Ghesquière , leaf elongation duration (LED) had a lower heritability. This could be partly explained by a lack of precision in the LED estimates since no measurement could be performed at the beginning of leaf growth, during the hidden phase. Spring and autumn leaf length averages in 'Herbie' were not significantly different. However, these similar leaf lengths were not reached by the same dynamics of leaf growth. It was observed a higher LERmax and a shorter LED in spring than in autumn, that could be explained by higher temperatures in spring (average of 16°C) than in autumn (average of 13°C). The correlation between leaf length and LERmax was higher than the one between leaf length and LED in spring and in autumn for both 'Herbie' and the core collection. Similar results were observed by Ghesquière  in a collection of late heading perennial ryegrass ecotypes with correlations of 0.86 and 0.53 between adult leaf length and average leaf elongation rate and LED, respectively. It could be explained by the fact that at the beginning of leaf growing process there is a long period of slow growth with no significant effect on the final leaf length. However, depending on the plant material, the impact of LERmax and LED on final leaf length could differ greatly (unpublished data). Since these two traits appear poorly correlated, a given final leaf length can result from different combinations of a wide range of LED and LER values. The density of SNPs was very high but comparable to that obtained in other genes in perennial ryegrass, bearing in mind that this parameter is highly variable over the genome [50, 51]. Nevertheless, the number of haplotypes observed in 'Herbie' is relatively weak compared to the haplotype numbers expected. Knowing that there were 336 individuals in the initial polycross of the 'Herbie' variety and considering that they were unrelated, 672 haplotypes were expected under the assumption of total absence of LD. However, only 39 haplotypes were observed, and among those, 30 had a frequency lower than 2%. This implies that the parents of 'Herbie' were related and some haplotypes were highly selected. This study in the highly diverse variety Herbie revealed that the GAI gene had a significant effect on leaf growth parameters: leaf length, maximum leaf elongation rate and leaf elongation duration, in both spring and autumn growing periods. This gene co-localized with QTL of lamina length found in spring and with QTL of leaf length and LER found in winter on linkage group 4 . One SNP, SNP069, explained a part of the variability of all leaf length parameters in both spring and autumn. It was also found significant in the tree-scanning analysis. However this SNP does not induce an amino acid variation. Considering the rapid LD decline, the mutation responsible for leaf growth variability in 'Herbie' should be very close and highly linked to SNP069. In Arabidopsis, wheat and maize, mutants responsible for dwarf phenotypes present a deletion on the DELLA domain [19, 21]. An association study on the whole gene sequence would be of interest to find the causal mutation. The possible association between the variation of the SNP069 and the variation of leaf length in 'Herbie' only by chance without any physical link between the SNP069 and the causal mutation (false positive) can be considered. This would imply that the SNP069 and a causal mutation elsewhere on the genome were in linkage disequilibrium. This LD can't come from a population substructure as we demonstrated the absence of structure in the population. It could come from a drift due to the sampling of a limited number of individuals (216) but this seems unlikely regarding the high significance of the SNP069 on leaf length. Nevertheless, in order to test the real physical association between the SNP069 and a causal mutation for leaf length, it would be interesting to create populations with GG or CC at the SNP069 and to compare their leaf length. A superdominance effect was found for all leaf growth parameters on SNP069 except for LERmax in autumn. This could be due to two very close SNPs with dominant effects with the favourable alleles in repulsion. This superdominance effect could also be explained by a real complementary effect of both alleles at a single SNP. Whatever the origin of the superdominance effect, this observation should have consequences on breeding strategies. The objective of molecular assisted selection could thus be to associate two alleles instead of fixing favourable alleles. The results of the three methods used for the association study were all in agreement. Nevertheless, the maximum number of associations was found with the regression analysis using SNPs which seems more effective since it explained a higher level of phenotypic variance than the other two methods. A possible explanation is that haplotypes cumulate alleles of several SNPs which could have opposite effects leading to a decrease in the difference between haplotypes. In the present study a single panmictic population, a synthetic variety, allowed us to detect a strong association between a SNP polymorphism and a trait. In the study of Skot  a strong association was detected between one SNP:4443 of the LpHD1 gene and heading date (HD). Nine populations of perennial ryegrass, each including 96 plants, were used. Despite an overall association of SNP:4443 and HD, this association was more or less strong depending on the population. This shows that LD varies between populations leading to associations in some populations but not in others. Regarding this observation, it would be of interest to perform association studies within panmictic populations rather than to use individuals from several populations. Indeed, different associations can be found depending on the population used. Unlike the findings of Thornsberry  in maize, we did not observe an effect of GAI gene on heading date in 'Herbie' (data not shown). However, we studied only a small part of the gene. In this study, we showed that i) association studies can be performed following the "candidate gene" approach on a synthetic variety with a wide genetic basis, and ii) the detection of association between phenotypic polymorphism and sequence polymorphism was more powerful using SNP polymorphism than haplotypic polymorphism. These observations could impact the way of using molecular information in plant breeding, in particular in outbreeding species. Indeed, the genetic basis of important traits could be directly detected in breeder populations and molecular markers used to increase favourable alleles. We thank F. Balfourier for seeds of cleverly chosen Cc population. We thank M Barillot, JF Bourcier, D Cadier, M Caillaud, P Cormenier, A Faure, F Gelin, C Gibbelin, J Jousse, C Largeaud for their technical help and Corinne Melin for her help on references management. We thank I Cameleyre and S Flajoulot for their advice in molecular biology. J Auzanneau received a PhD grant from the Région Poitou-Charentes. JA phenotyped and genotyped the Herbie and Cc populations. AEG estimated LER and LED using a beta function. BJ and FG have been involved in the interpretation of data in genetics and ecophysiology, respectively. PB and CH coordinated the project and have made substantial contributions to conception and design of the project. PB, JA and AEG performed statistical analyses and wrote the manuscript. All the authors read and approved the final manuscript.